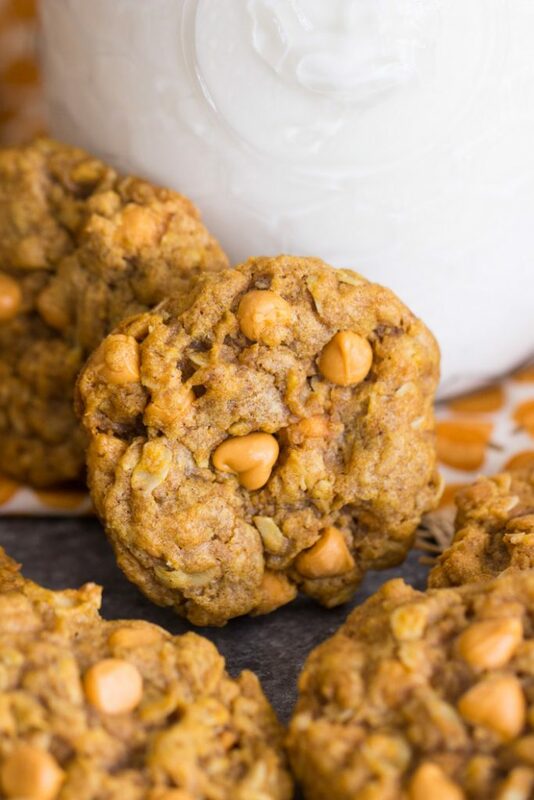 These Pumpkin Oatmeal Scotchies are simple to make, and boast some of the best flavors of fall! 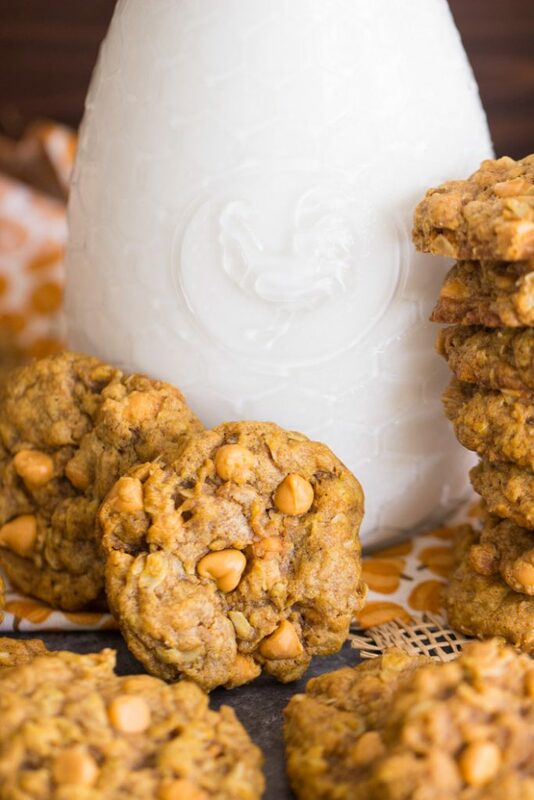 Thick, soft, chewy oatmeal cookies, bolstered with pumpkin and spices, and loaded with creamy butterscotch chips! 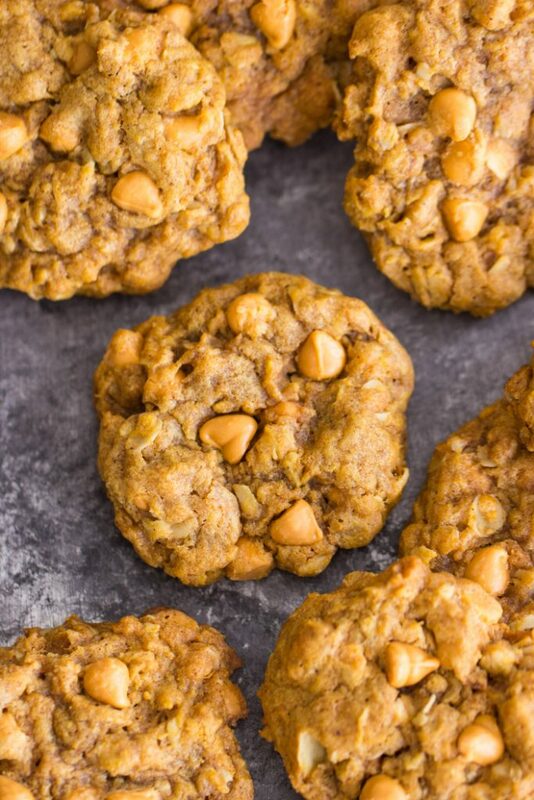 Try them once, and Pumpkin Oatmeal Scotchies will become a new fall classic! 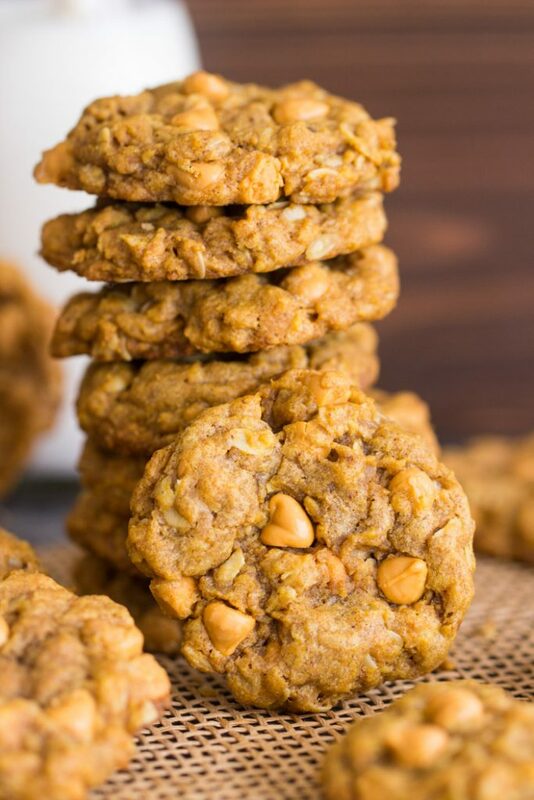 I don’t know about you, but these Pumpkin Oatmeal Scotchies are ALL my cookie dreams coming true! Other than some classic, favorite family recipes, like this No-Bake Peanut Butter Pie recipe, or Cracked Top Ginger Cookies, a favorite dessert of life for me was always Oatmeal Scotchies. I loved them as a kid, and love them to this day. 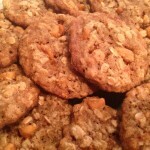 Oatmeal Scotchies were a personal favorite of mine for as long as I can remember. My middle school best friend used to make them for me! She knew how much I loved them, and I always remember her family having Oatmeal Scotchies around. I don’t even think I knew what they were until I was introduced to them by her family. So although they’re not a family recipe, they were always one of my personal top favorites. 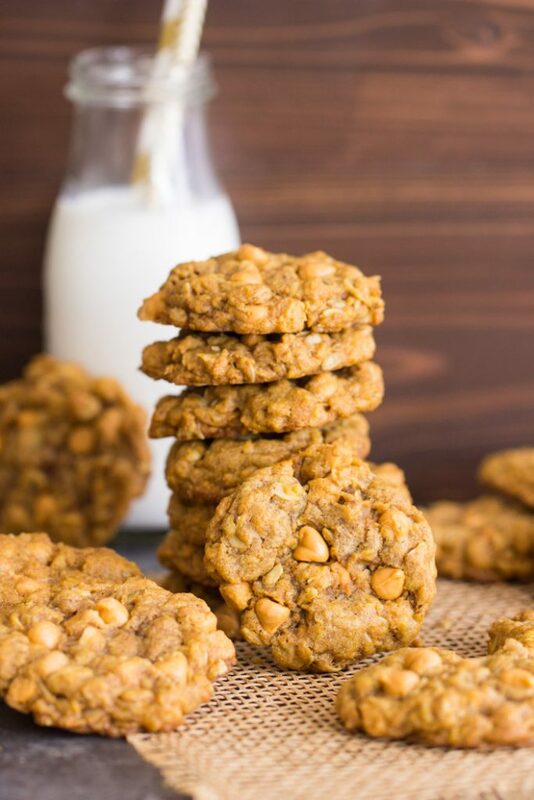 I’ve made them for years now, and there’s very little not to love about a soft, chewy, buttery oatmeal cookie, dotted with sweet, creamy butterscotch chips. How does one improve upon such cookie perfection? Well, if it’s fall, then the way to make anything better is with pumpkin. I brainstorm fall recipes year-round, and this one has been on the list for months. 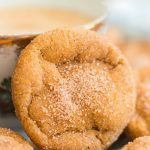 I knew I wanted to lace Oatmeal Scotchies with pumpkin to make Pumpkin Oatmeal Scotchies, and it finally happened this year. YAY. I don’t have a pumpkin oatmeal cookie recipe of my own yet, so I adapted from another recipe, and then added butterscotch chips. Boom. That was easy enough. I may keep tweaking it a little further because I have a personal twist I’d like to incorporate, but the result here is sensational. 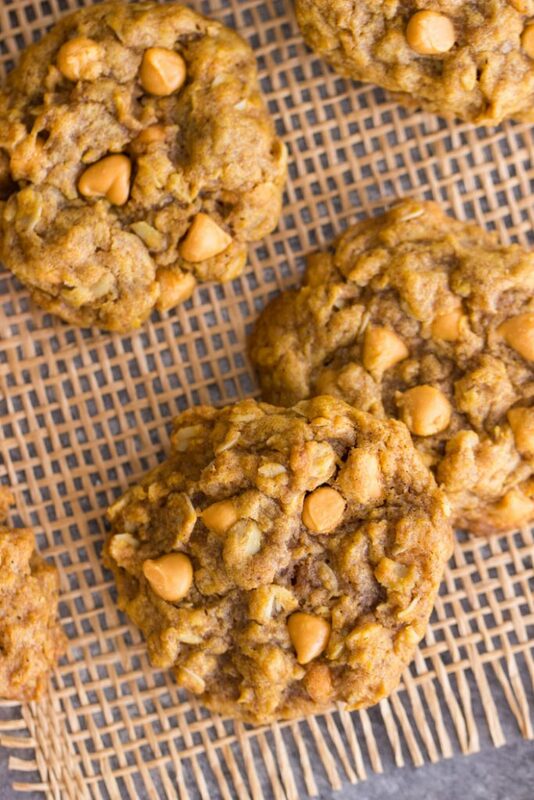 Soft, chewy oatmeal cookies, with lots of butter and brown sugar, and a pretty big heap of pumpkin. Lots of spice, and no shortage of delicious butterscotch chips. 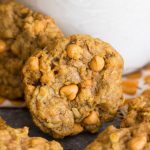 If Oatmeal Scotchies were ever your speed, and you’re a person who loves pumpkin ‘all-the-things’, then you must try these Pumpkin Oatmeal Scotchies! 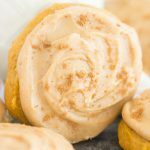 And if you’re looking for other pumpkin cookie recipes, these Pumpkin Cookies with Brown Butter Icing are a looooongtime tried-and-true (plus they have brown butter goodness!! 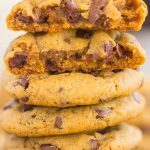 ), these Pumpkin Spice Latte Cookies are incredible, and these new Pumpkin Chocolate Chip Bars are gooey, melty, and prove why chocolate and pumpkin are a superb combo! In a large bowl, stir together oats, flour, baking soda, cinnamon, and pumpkin pie spice. In another large bowl, whisk together butter, sugar, brown sugar, egg yolk, vanilla, and pumpkin puree. Add the wet ingredients to the dry ingredients, and stir until just combined. Do not overmix - it leads to 'tough' cookies. Fold in 1 1/2 cups butterscotch chips. 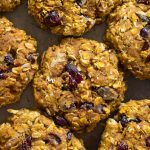 Drop by heaping tablespoonful (golf ball-sized) onto parchment paper or silicone mat-lined baking sheets. Flatten slightly - cookies won't spread a whole lot. With the remaining 1/2 cup butterscotch chips, dot 3-4 chips on the top of each cookie. Bake at 350 degrees for 13-15 minutes, or until edges are golden, and the centers appear almost 'set'. Remove from heat, and cool on cookies sheets for about 5 minutes before removing to wire racks to cool completely.